A while back I listened to the Analytics FC podcast, episode 4 and now recently the episode 14. Among other things they talked about womens football and the lack of available (open) data. When I heard it I thought I’d give a try with the data I have gathered for the Swedish League – Damallsvenskan. So here is the summary of Damallsvenskan 2015! 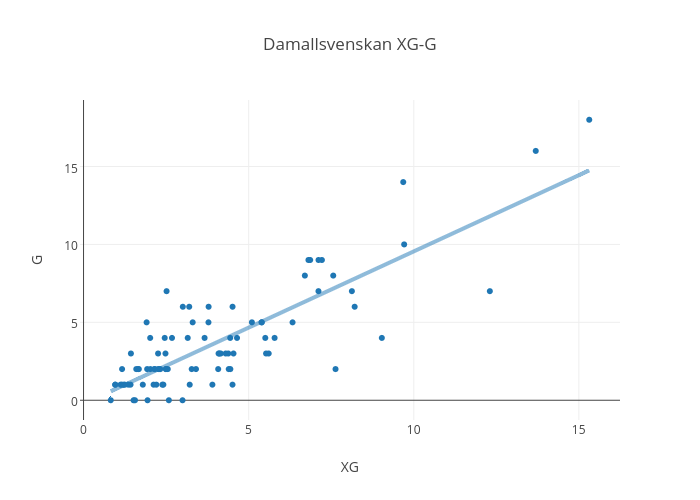 When it comes to Swedish club football there is no doubt that Damallsvenskan is way better ranked than Allsvenskan so perhaps some of my international readers will be more interested in this. Damallsvenskan still have some of the best players in the world. So in this post we will look at the numbers for a few world class players! Here comes a brief summary of Damallsvenskan by numbers. The data set is not 100% complete, a handful games are missing so the XG-G maps do not take every game played throughout the season in account but they still say quite a bit about the players and teams style and efficiency. 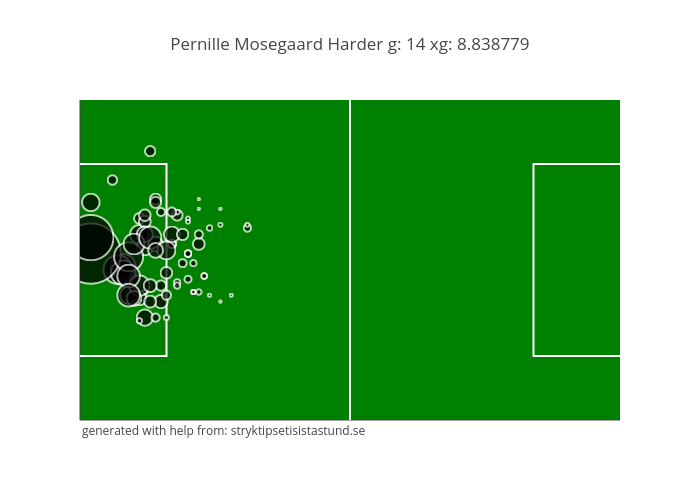 First, let’s look att XG-G for all players who have taken more than 10 shots. We can see three clear under performers and a few players who has had great seasons. For Gaelle Enganamouit, all games are recorded with shot data but for the other two with the best G-XG some games are missing. Still they are impressive numbers. It’s also clear that Pauline Hammarlund is a more pronounced box-player! Well, Sanna Talonen hasn’t had the best of season. Missing a lot of clear chances to say the least. Some data is missing there. She has scored 4 goals in total this season but even if they are from games where she only has taken one shot these numbers are bad. To round up the player part, let’s look at the big names of Damallsvenskan, including five time FIFA World Player of the Year winner Marta. 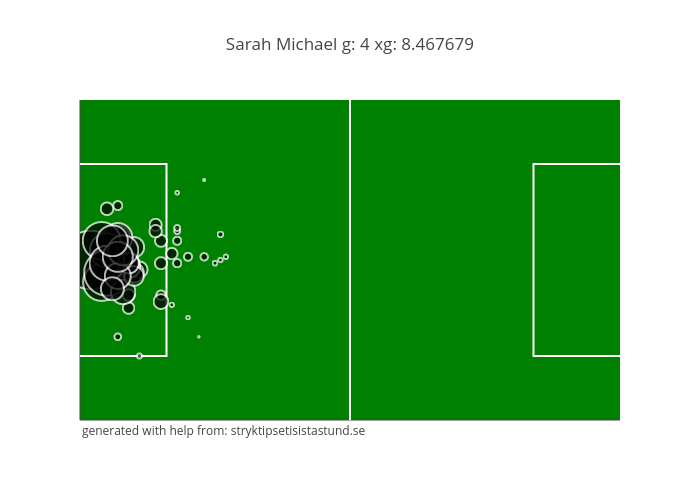 Her shot map also really stands out from the rest, being all over the place with a clear emphasis of finishes from the wide right hand corner of the penalty area! At the bottom end of the table Mallbacken may be thankful for avoiding relegation, only conceding 36 goals for an expected 54! I would definitely give their goalkeeper Jennifer Falk the title Goalkeeper of the Year! Well, a few games are missing but here are the teams finishes plotted for(left) and against(right). Would it kill you to label the axes? 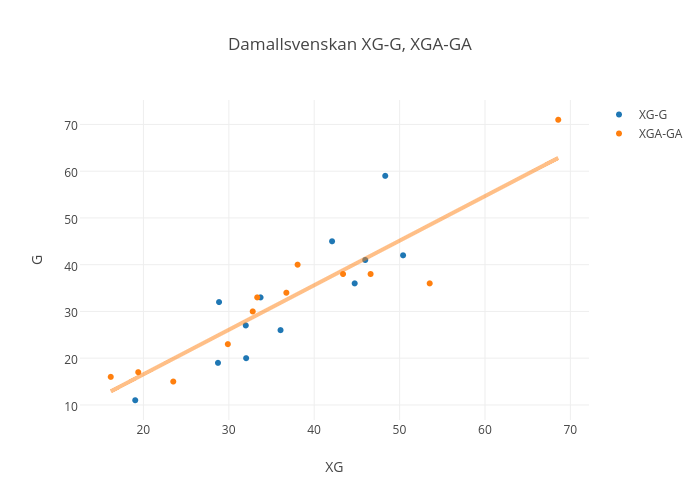 XG-G would be the difference between the expexted goal number and the actual goals scored while XGA-GA is the same but for conceded goals. Just a better way to measure efficiency than lokking at shots ratios. 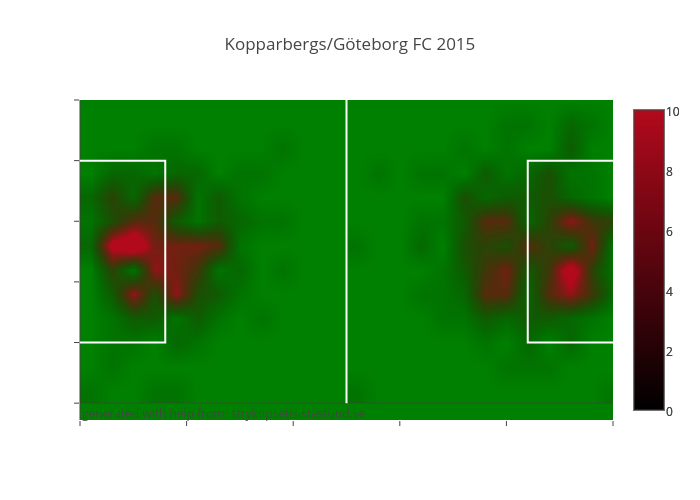 Previous Previous post: Featured in the ÖFK-podcast and upcoming XG-justice!